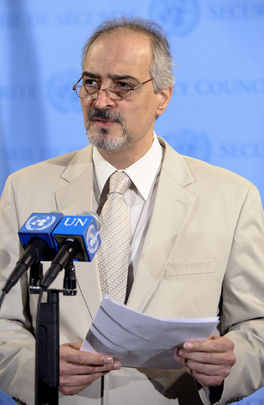 UNITED NATIONS, September 29 -- On the way into the Syria consultations of the UN Security Council Thursday afternoon, Russian Ambassador Vitaly Churkin told the press he was "not optimistic" that a resolution would be adopted. By contrast earlier in the day, French Ambassador Gerard Araud predicted a vote Friday or Monday. When Indian Ambassador Hardeep Singh Puri left the consultations after 5 pm, he said that two drafts had been considered -- the European and the Russian -- and that a new draft would be circulated by 8 pm. Both he and Churkin were asked about Operative Paragraph 9, providing that if the resolution is not complied with sanctions would be considered. "Let's respect the sanctity of negotiations," said Hardeep Singn Puri. "I'm not going there," Churkin said, adding that there should be "no ambiguity about dialogue," and no preconditions to dialogue. This is similar to the stand off around Darfur in Sudan and the conditions to implement to so-called Darfur Peace Process. As South Africa said about Darfur, Russia said Thursday about Syria: you can't wait for the perfect conditions to have dialogue, it must begin. China's Deputy Permanent Representative Wang was asked which draft would be negotiated. He paused then said "the current one" to laughter. Wang headed to his Mission, as did the Press. Watch this site.